Recent media coverage has sensationalized the criminal investigation of several cardiologists for the possibility of performing fraudulent cardiac procedures. Is this a case of individuals with unethical conduct? Or, does it point toward a more systemic problem in medical care, where Medicare dollars are wasted on unneeded care? As reported in Heartwire on July 27, 2011: "A federal jury convicted McLean, 59, on six charges of healthcare fraud relating to insurance claims he'd filed for stents deemed to have been placed unnecessarily, as well as for ordering unnecessary tests and making false entries in patient medical records ... evidence brought forward suggested that McLean had performed cardiac catheterizations and implanted unnecessary cardiac stents in more than 100 patients. He then falsely recorded in the patients' medical records the existence or extent of coronary artery blockage, known as lesions, observed during the procedures in order to justify the stent and the submission of claims to healthcare benefit programs, including Medicare and Medicaid." In a separate case the Senate Finance Committee investigated Dr. Mark Midei, an interventional cardiologist practicing in Towson, Md., for the possibility of performing unnecessary stents and also for his relationship with Abbott Laboratories, the company that manufactures the stents that he used. A prominent cardiologist commented in the New York Times report: "What was going on in Baltimore is going on right now in every city in America," saying that he routinely treats patients who have been given multiple unneeded stents. "We're spending a fortune as a country on procedures that people don't need." Coronary artery disease affects a large proportion of people in Western civilization. The disease manifests as blockages in coronary arteries limiting blood flow to heart muscle, causing heart pain, heart attacks, heart failure and/or sudden death. Heart disease kills 1 out of every 6 Americans. Coronary artery stents are metal mesh tubes that can be placed in blocked coronary arteries completely reopening them and improving blood flow to the heart muscle. Many studies (PAMI, TACTICS-TIMI 18, etc.) have shown that when used appropriately, stents can be life-saving and improve quality of life by relieving heart pains (angina) and preventing heart attacks. However, in 2007 the COURAGE trial was published demonstrating that in some patients with coronary artery disease, there was no mortality or heart attack benefit associated with an initial treatment strategy of using stents, compared with medication treatment. The trial also found evidence that a strategy of using medications alone could potentially save money. In considering these results, several caveats must be kept in mind. Patients included in the study were very select (less than 1 in 15 patients considered were actually studied); they tended to have mild disease (78% had either no or only slight symptoms; patients with recent heart attacks were excluded); ~1/3 of patients initially treated with medications alone eventually required stents for their blockages anyway. In addition, patients who underwent initial treatment with stents had a quicker improvement in quality of life as compared to patients who initially were treated with medications alone. Nonetheless, this single study suggested that the need for coronary stenting is unnecessary in at least some patients with coronary artery disease, and that trying medication therapy alone in those patients is reasonable. There is ongoing investigation designed to confirm or refute the observations of the COURAGE trial. In a New York Times editorial entitled Cut Medicare, Help Patients, authors Ezekiel Emanuel and Jeffrey Liebman discuss the use of cardiac stents for treatment of symptomatic coronary artery disease suggesting that many stents are unneeded: "Every year more than 1 million cardiac stents are placed in patients to open blocked arteries ... many patients who receive stents paid for by Medicare are either experiencing no pain or have not tried medication first." In a review of national registry data published this year in JAMA by Chan et al. it was concluded that by current criteria 1% to 11.6% of stents placed may have been "inappropriate" based in part on the results of the COURAGE study. It is important to distinguish between "unneeded care" due to fraud and "unneeded care" due to less expensive but similarly effective alternatives. Fraud implies dishonest intent. Unneeded care due to fraud is universally considered to be wrong. In contrast, calling care unneeded because there are less expensive and similarly effective alternatives is subject to a broad range of opinion. In an article that I read recently Dr. Maneesh Patel (Duke Clinical Research Institute, Durham, NC) made the important point: "[T]he majority of what we do in medicine is based on evidence that would fall into the category of 'uncertain'"--for example, guideline recommendations with level of evidence B or C."
The Maryland cardiologists are accused fraud, or falsely recording the presence of significant coronary artery disease, and billing health insurance for placing stents in such patients. This is very different than choosing to treat significant coronary artery disease with a stent when medical therapy alone may also be a reasonable strategy in preventing death or myocardial infarction (heart attack). Here's an example: a 50 year old man was found to have calcifications in his coronary arteries on a chest CT done for follow up of cancer (presumed cured). On questioning, the patient, who has high blood pressure, high cholesterol, and a family history of heart disease, noticed some shortness of breath with exertion, potentially due to obstructive coronary artery disease. An exercise treadmill test was ordered and was positive after 10 minutes. An exercise echocardiogram was ordered and showed a possible small area of reduced blood flow after 10 minutes. A cardiac catheterization was ordered and an 80% blockage of one artery was found. A stent was placed and the patient was started on blood thinners. The patient also had 30% to 50% blockages in other locations and was advised to take more cholesterol and blood pressure medication. Which of the tests/treatments in this case were unnecessary? If the coronary blockage was 40% and not 80%, the stenting here would be universally considered to be unnecessary. (Furthermore, if the physician knowingly reported this 40% blockage as 80%, stented it, and billed for it, then it would constitute fraud). 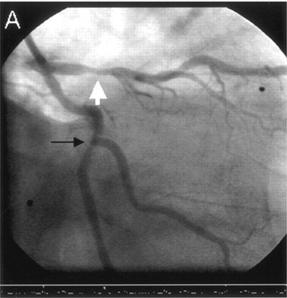 If the coronary artery blockage was truly 80%, then according to the results of the COURAGE trial, first trying medical therapy alone could be as effective as immediately using stents for the purposes of minimizing the cardiovascular mortality in this patient (but perhaps not from the point of view of immediately relieving his symptoms). In this situation, the immediate stent placement could also be considered "unnecessary." With a proposal to add "cost-conscious care and stewardship of resources" as one of the ACGME's core competencies for medical trainees, and with Medicare aggressively tightening its belt in order to remain fiscally solvent, determining "unnecessary care" will depend on developing a consensus on the value of life, suffering, and the validity of extrapolating scientific data analysis to a multitude of individual specific patient situations. As health professionals and policy makers appropriately engage in this discussion about what represents effective care that health insurance should pay for, they should be careful not to equate outliers, such as doctors facing criminal charges for fraud, with accepted variation in standard practice that might encompasses care that some deem "unneeded." Equating unneeded care with dishonest intent is bound to elicit a highly emotional response from most doctors, who are deeply committed to their professional obligation to do what they believe is best for their patients. This column was co-Authored by Juliet K. Mavromatis, MD, FACP, Personalized Primary Care Atlanta and Kreton Mavromatis, MD, Assistant Professor of Medicine, Emory University, Director of the Cardiac Catheterization Laboratory, Atlanta VA Medical Center. Juliet K. Mavromatis, FACP, is a primary care physician in Atlanta, Ga. Previous to her primary care practice, she served on the general internal medicine faculty of Emory University, where she practiced clinical medicine and taught internal medicine residents for 12 years, and led initiatives to improve the quality of care for patients with diabetes. This work fostered an interest in innovative models of primary care delivery. Her blog, DrDialogue, acts as a conversation about health topics for patients and health professionals. This post originally appeared there.